Our High Performance 80W/10W*8pcs LED Light Bars are ideal for use with Land Rover Defenders with a lifespan of over 50,000 hours. The LED Light Bars contain technology that eliminates flickering caused by the CAN-BUS electrical system on later models making these spotlights simply plug & play. The mounting bracket can be fitted vertically or at 90 degrees, making these spots ideal for fitting to a D bar, winch bumper and or roof rack. 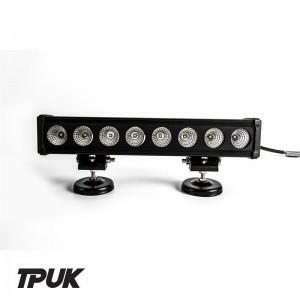 The LED Light Bars are IP67 rated. Simply put; they are water/dust proof.